I’ve been extremely busy of late doing radio interviews by telephone, preparing upcoming presentations, keeping up with correspondence, and adding content to my blogs. As I get these interviews and presentations processed and edited, they will be added here. See the sidebar under My Audio-visual presentations. I’ll soon be on the move again doing presentations and visits in various parts of North America. Here’s a partial list of my still evolving itinerary. Presenter. In the lecture series titled Reinventing the World––Redefining Wealth, Rethinking Economics, Reforming Health Care & Rebuilding Community. October 27, San Francisco State University, San Francisco, CA. Before leaving California in May, I journeyed to Ukiah where I spent a couple hours being interviewed by Michael and Justine Toms for their nationally syndicated New Dimensions radio program. (See description below). That program is scheduled to air during the week of September 23-29, 2009 (their broadcast week begins on a Wednesday). A shorter (11 minute) interview that we did, entitled “Toward a Credit Commons,” is available now and can listened to or downloaded at New Dimensions Café. Go to http://www.newdimensions.org and on the left-hand side click on New Dimensions Café Listen Now! If you would like to subscribe to the New Dimensions Café podcast which features many of the guests that appear on New Dimensions, it is available for a free subscription on the home page as well. The one-hour “flagship” New Dimensions radio program, “Investing in the Bank of You and Me” (Program 3308) will be airing the week beginning Wednesday, September 23-29. You can hear it streaming on the New Dimensions website that week for free. You can also hear it on a radio station close to you during that week. Go to “Listening Options” in their website for a list of stations that carry “New Dimensions.” It will also be available to download for a small charge. This interview, as well as over 850 others, is part of their wonderful archive. New Dimensions is working in partnership with Stanford University Library to digitize their entire archive of over 8000 hours of deep dialogues with hundreds of the most innovative movers and shakers on the planet. More hours are added to the archive every week. INVESTING IN THE BANK OF YOU AND ME, with THOMAS GRECO, Jr. It continues with an outline of recent and historical developments that make the case, but concludes on a hopeful note with my brief description of existing cashless exchange mechanisms that are not dependent upon political money or banks. You can read the complete article here. The dysfunctional nature of the dominant global system of money and banking has for a long time been apparent to anyone who has cared to look at it. 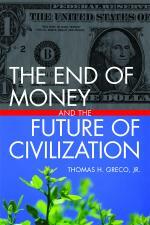 Now, in light of the present financial meltdown, it has become painfully obvious to virtually everyone. What most people have failed to recognize is that, regardless of the nominal form of their government, their political power has been neutralized and exhausted by the privatization and misallocation of credit money. The political money and banking system disempowers communities and enables a small elite to use the present centralized control mechanisms to their own advantage and purpose. It misallocates credit, making it both scarce and expensive for the productive private sector while enabling central governments to circumvent, by deficit spending, the natural limits imposed by its above-board revenue streams. Read more..
That article also explains how the “Greenback solution” being proposed by many monetary reformers, fails to address the fundamentally undemocratic nature of centralized control of money. Be sure also to view the important imbedded videos on this site featuring Peter Schiff, Matt Taibi, and Congressman Alan Grayson. This is a time of transition that requires us to inform ourselves and to take responsibility for our own health, education, and wellbeing, not in isolation but in communities of cooperation, sharing, and mutual support. –t.h.g. This entry was posted in Finance and Economics, My activities, The Political Money System and tagged Greco, new dimensions, tour. Bookmark the permalink.